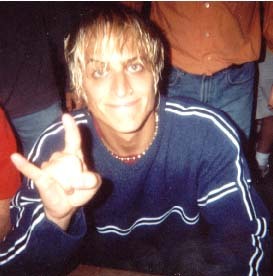 These are pictures of the band Fuel. They hail from my hometown of Harrisburg, PA, and have now become a household name. Congrats. boys!!! This is a picture of Brett. 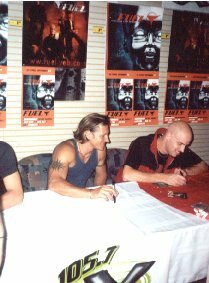 This picture was taken during the summer of 2000 at 'X' A Day In The Park. This is a picture of Kevin and Carl taken the same day as the one of Brett. This is a picture of Kevin and Carl. 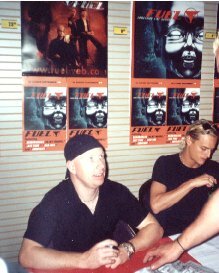 This picture was taken at a local MediaPlay some time around 12:30 A.M. when their new cd was released. This is a picture of Jeff and Brett at MediaPlay, taken during their cd release "party". This is a picture of Jeff, Brett and Carl taken at 'X'-A Day In The Park, during the summer of 2000.